(Huntsville, Alabama) July 7, 2010 - Schwarze Industries, one of the world's largest street sweeper manufacturers, announced today a load leveler option available for all M6000 mechanical street sweepers. 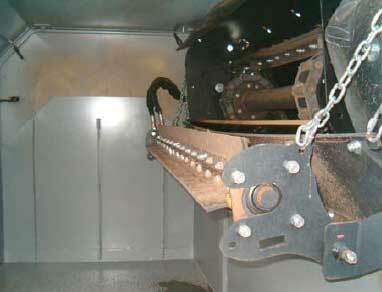 The Schwarze patent-pending Load Leveler increases usable capacity by evenly distributing debris inside the hopper. An on-demand switch activates the load leveler, which works with both wet and dry debris. "We talked with drivers and found that there was a need to address uneven debris distribution in street sweeping," said Raymond Massey, Director of Sales and Marketing for Schwarze. "Previously, drivers were having to periodically tap the breaks to level out debris. With the Schwarze Load Leveler option, they are able to increase usable capacity up to 25% inside the hopper without driver intervention. "Not only does this increase the amount of collected debris, it increases productivity due to less time dumping and eliminates excessive wear on the chassis brake system as well as adds comfort for the operator." Available through Schwarze's extensive dealer network, the Load Leveler can also be retrofitted to any Schwarze Industries M6000 Sweeper. Contact your local dealer for additional information about this industry-leading feature. Since its inception more than 30 years ago, Schwarze Industries, Inc. has grown to become one of the world's largest street sweeper manufacturers and a leader in sweeping technology. Headquartered in Huntsville, Alabama, Schwarze has a workforce of more than 200 employees, manufacturing street sweepers, parking lot sweepers, and road repair units. In 1996 Schwarze opened a manufacturing facility in Brisbane, Australia to meet the demand for products in other parts of the world. To date, Schwarze Industries' products operate in more than 35 countries. For more information on the updated A4000 sweeper, visit www.schwarze.com or contact Raymond Massey at 800.879.7933. © 2010 World Sweeper All rights reserved.